Several years ago I came home from Jamie Gossard’s garden and exclaimed to Sandy “Man alive, Jamie sure has some neat teeth UF seedlings.” Sandy snarled at me for not paying closer attention to her daylilies and shot back “what do you think I’m doing ! ” Thinking about her comment in reflection, I imagine when many people get out and see daylilies hybridized from other people they forget the creations they are closest to. It was probably a stupid thing to say to her. So tonight I’ll recognize Sandy for also having really nice teeth unusual form daylilies. For Sandy the journey started several years ago when she decided she’d like to to blend self large daylilies with teeth. I was eager to help her with this crossover. And I quickly supplied her with a few parents that I thought would do the trick. Sandy had already used for years SEE ME-FEEL ME-TOUCH ME in her program to produce large clean colored daylilies with varying degrees of small teeth . The next step was to add xtra fancy edges. She took a seedling that I call “fancy green edge” to these clean colors several years back and this year and she bloomed a bunch home runs. Sandy’s seedling in the image, I find of high value. It is crossed to my introduction this year, not yet named, 1513, by Fancy Green Edge. 1513 is a red seedling out of Jamie Gossard’s Wolverine. Wolverine is a Tetra Spindazzle kid ,with around 5 doses of Tetra Spindazzle in it. In the seedling pictured, wow, Fancy Green Edge stripped all the color from the red pod parent 1513. Pictured is a 10″ flower on a tall scape. Way to go Sandy! I bet Jamie Gossard will be paying her a visit for this one. 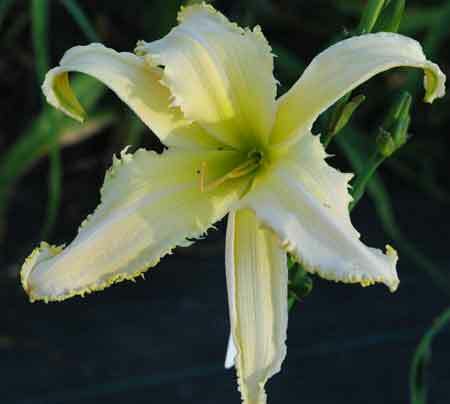 This entry was posted in Daylily Hybridizing, Introductions, Seedlings and tagged daylily, daylily blog, Jamie Gossard, Sandy Holmes, SEE ME FEEL ME TOUCH ME, Tetra Spindazzle. Bookmark the permalink.